Property Size 2,550 sq. ft.
Making memories at Mountain Memories is what this cabin is all about! Located in the popular Coosawattee River Resort, guests of this beautiful home enjoy all the amenities that the resort offers and at NO ADDITIONAL CHARGE! From the Rec Center with its Olympic Size Heated Indoor pool, to the tennis and basketball courts, putt putt golf, exercise facility, to fishing at one of the stocked ponds or native rivers located in the resort, there is sure to be something here for everyone! This home is privately situated in the woods approximately 10 minutes from the Gate with easy access. There is a large covered porch on the back side of the home overlooking the woods which many deer, turkey and other wildlife call home. There is a gas grill (propane provided) on the wrap around covered porch as well as a large hot tub on the terrace level. A fire pit provides a great place for telling ghost stories or "fish tales" and enjoying everybody's favorite, roasted marshmallows! The Great Room is just beautiful with a stunning stacked rock gas fireplace, sure to take the chill off those chilly evenings in the North GA Mountains. The well appointed kitchen has a large dining area as well as breakfast bar to enjoy meals with friends or family. There is a King Bedroom on the main level with a large full bath with tub/shower combo as well as a full size washer and dryer. The bedroom on this level also provides access to the covered porch. 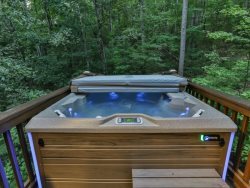 Upstairs, you will find the King Master with it's own private screened-in balcony, huge master bath with jetted tub and walk-in shower. There is a very spacious loft overlooking the Great Room which homes 2 twin futons and a queen sofa sleeper. Downstairs, you'll find a pool/ping pong table, another living area with a 42" Flat Screen as well as a Queen Sleeper Sofa. There is a wet bar with mini fridge and microwave for snacking while watching a good movie or enjoying a competitive game of pool. You'll also find another Queen Bedroom on this level with a full bath with tub/shower combo. Close to historic downtown Ellijay in the 'Apple Capital' of Georgia! The Apple Festival is held on the second and third full weekends in October. Delicious apple products and wonderful crafters are what make our Apple Festival so famous! Did we forget to mention this home is pet friendly? So why wait, pack some bags, fill the cooler and head on up to make your own "Mountain Memories". Have been an annual renter of Mountain Oasis Cabins. Every single one I've rented has been awesome! We would definitely stay here again or try out another mountain oasis cabin! We had a total of 12 people one night, plenty of room for everyone to sleep. The kitchen was nicely stocked and even had a crock pot which came in handy. Firepit was on main level which made it a lot easier to use. Location felt away and in the woods, while being very close to town. We thoroughly enjoyed our stay! The cabin was beautiful, well-stocked and clean! Sitting out on the porch and listening to the river was so relaxing! This was one of those vacations that ended and you werent ready to go home! I highly recommend this place for a family vacation! The peacefulness alone is enough to make me want to come back but it has so much more to offer from their olympic-size pool, goofy golf, tennis courts to being able to see deer in your front or back yard. This was our second stay here & will definitely be returning! Our families were very impressed with the property. The beds were very comfortable. We appreciated the cleanliness and the fact that there were plenty of cooking utensils. Our stay at Mountain memories exceeded our expectations. Great customer service and great rental property options. The property we rented was clean and lovely with all the amenities working. I will definitely book directly with Mountain Oasis instead of going via a third party. :) Mountain Oasis was also great in always answering the phone with a live person and they were very helpful in answering all of my questions. Stayed at this house with my family during hurricane Irma. We couldn't have been happier. It was very private, yet close to the cute town of Ellijay. The secluded roads were great for meandering walks with the dogs. We visited the local coffee shop in town a couple times, which was great. We'd definitely go back. My family & friends truly enjoyed our stay. Very satisfied with accommodation and service. Looking foward to the next stay! Great experience, Great staff, As advertised! Looking forward to our next stay! Everything was perfect at Mountain Memories! Great Stay!